Isadora Lancaster is in hell. She passed on a European vacation with her parents, choosing instead to spend an amazing summer with her boyfriend. But that plan changed when she walked in on him and another woman. Now Izzy’s stuck in a town she’s avoided since high school, and has to face uncomfortable truths about her past—including the best friend that abandoned her during their senior year. The boy that broke her heart. 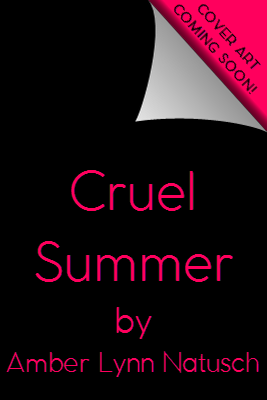 “1982: Cruel Summer” is a stand-alone, new adult romance novella. Before the internet…before sext messages, selfies, like buttons, and d**k picks…epic loves and broken hearts played out offline, on mixtapes that became the self-made soundtracks of a generation. Love in the 80s: A New Adult Mix is a collection of ten contemporary romance, new adult, stand-alone novellas set in the 1980s. Written by award-winning and bestselling authors, one digital novella will be released on the last Friday of each month January – October in 2016. The title of each love story will be a hit song from the year that the novella represents. The totally awesome authors include: Casey L. Bond, Lindy Zart, Cambria Hebert, Amber Lynn Natusch, Misty Provencher, Rebecca Yarros, Rachel Higginson, RK Ryals, Cameo Renae and Chelsea Fine. Love in the 80s: A New Adult Mix was created by UTOPiAcon founder, Janet Wallace, and is co-produced with award-winning book cover designer, Regina Wamba (together they are WaWa Productions). Kit’s life is moving along without a hitch. New job, new boyfriend, new best girlfriend for a confidant. Just when everything seems picture perfect, her blissful existence unravels one happy thread at a time. Strange dreams about an old love from high school disrupt her sleep, reminding her of an unresolved issue haunting her since the day she graduated. A greedy contractor is intent on destroying the old family home where she works, and Kit’s adored cousin who owns the home simply wants to wash her hands of it all. When a new guy comes to town, she hopes their burgeoning relationship will take her mind off the chaos and restore order. Her wish is shattered when gruesome events occur unexpected, and she’s left fighting them off one nasty surprise after the other. Worse, she must choose between two men who vie for her attention. One of them desperately wants something from her. The other is not what he appears. “It’s getting late. C’mon. I’ll walk you home.” He scooted his chair back and stood up, picking up his empty dishes and cup. Kit did likewise, and within moments, they’d exited the coffee shop and made their way back to her apartment. When they reached the outside front door to the building, she turned to say goodbye. “Thanks for dinner and going walking with me. I really enjoyed getting out tonight.” “You were a great tour guide, and I liked the stories, though they were tragic.” He leaned against the doorframe, his body hemming her in against the door. “But I guess that’s what makes them intriguing in their own twisted way.” An unexplained shyness crept over her again. He was so close to her, warm breath caressing her ear. She managed a grin. “Yes, tragedy has its own appeal.” Steven’s breathing picked up a faster pace, and his eyes glistened with urgency. “Kit, do you mind me being forward and doing one last thing before I go?” A rush of excitement quickened her pulse. He didn’t need to ask permission or speak. All he needed to do was act. She didn’t flinch when he turned up her face to his with a gentle lift of his finger, and settled his lips onto hers with the most intense kiss. Her mouth opened, receiving his insistent tongue, soft and moist, gracing her with tender flicks and caresses. Time stood still while she briefly drowned in his embrace. The inside of her body mimicked a blazing fire. What she wouldn’t give to let this moment with him last forever. When the reality of it hit her senses, she tensed a little and pulled away, overwhelmed and unable to handle more. “Did I do something wrong?” He hugged her. “Maybe I jumped too soon. I’m so sorry.” “No, it’s okay. You’re fine. I promise.” Kit delivered him a nervous grin, stroking his cheek. “You’re, um, awfully good at kissing. The best I’ve had in a long time.” “Yeah?” He let out a soft chuckle. “I find that hard to believe.” She grimaced. “I wish I was lying, but then I’d be lying.” He laughed again. “You’re cute, you know that?” The smile left his face, and he peered down at her again. “Can I have one more kiss before I go back to my place?” Not waiting for an answer, he kissed her again, with more passion than before, leaving her breathless. “There, now I think that ought to do it.” With a stroke of his finger, he brushed away a wisp of hair from her forehead. “Go ahead and unlock the door so I can see that you got inside safe and sound.” She inserted the key and opened the door. “Okay, I’m in now. My apartment is just at the top of those stairs. I’ll lock this one.” “Very good.” He stepped back. “Can we get together again?” Kit shot him a wide grin. “I’d love to. We’ll hook up and work out the details.” “Can’t wait.” Steven waved before heading off into the night. When he’d become no more than a ghostly etch in the darkness, she turned around and went inside. Across the street, the clock from the church chimed the nighttime hour. Time for bed, or time for a new beginning? For the moment, both sounded right. Scarlet Darkwood is an author with Booktrope, along with publishing other material as an indie publisher. Writing in several genres allows her to unleash her imagination in different directions, creating stories for different audiences. From a young age, she’s enjoyed writing and keeping diaries, but didn’t start creating novels until 2012. She’s a Southern girl who lives in Tennessee and enjoys the beauty of the mountains. She lives in Nashville with her spouse and two rambunctious kitties. Authors, crafters, and entrepreneurs have a special place in her heart. She likes to help others in these areas, and appreciates creativity in all its forms. She’s happiest in her shop, where she sells retail, or in front of her computer creating the next entertaining story. Kit has it all going for her–a job she loves, her cousin’s childhood home that now houses the Historical Society, and an adoring new boyfriend. Then things start to unravel. First, it seems she is being haunted by the ghost of her high school boyfriend. Then her cousin caves in to pressure from a local developer to sell the Stothwell Mansion so he can demolish it and build new condos. Finally, a mysterious new man enters her life and disrupts the cozy relationship she has with Dwight. As she and her coworkers fight to save the historic mansion, she begins receiving threatening messages and packages. She has to figure out who is threatening her before it’s too late. This is a fairly fast-paced story that kept me turning pages even after declaring that I needed to stop reading for the night. For the most part, I enjoyed the suspense and the mystery that weaved their way through the plot. The paranormal elements were well-written and not overdone, so they were quite believable. My only real irritation was Kit herself. I wanted to smack her around over her involvement in the love triangle she had with Dwight and Steven. At some points she was quite physical with both of them, which really made me question her character a bit. Without revealing the ending, I was pleased that she finally ended up with the one she did. I have to admit, I kind of suspected what would happen with the other man, but that resolution was well done as well. In high school, I was very quiet, studious, and shy. I was content to hide behind a book and watch the world ignore me. I rarely did anything to draw attention to myself, except when it came to my wardrobe. I always had an eye for mixing colors and patterns that most people, even in the 80s, found odd. A lot of classmates made fun of my fashion sense, or lack thereof, but I continued creating memorable outfits nonetheless. One of my favorite outfits was a handmade set of overalls in a very bright fish print. Since I am a Pisces, I squealed ecstatically when I found the fabric at the Ben Franklin craft store. It was a fuschia background adorned with multicolored fish outlined with bold black lines. I bought the fabric and a pattern for overalls and quickly pieced it together one weekend. The following week, I paired them with a black turtleneck and accessorized with an over-sized red shirt, black boots, and a necklace made of disco-ball beads. Another favorite high school outfit was entirely black and white, but my mom said the way I combined the pieces made the outfit “too outlandish” for school. I wore it anyway. This ensemble consisted of my ubiquitous black turtleneck paired with a billowy white skirt. I topped it off with a white vest, a thick black leather belt, black tights, and white ballerina slippers. It was quite stunning, although I didn’t wear it very often because white and I…um…really didn’t get along. My weird fashion followed me right into college, where I continued to have fun with colors and textures. One of my favorite outfits from freshman year consisted of a bright yellow pantsuit that I topped off with red boots, a shaker sweater in red or turquoise, and a black hat adorned with red and yellow leis from a Hawaiian-themed party. One of my professors gushed about my creativity the first time I wore this combination to class. He said, “Debby, that is a wonderful outfit! You look like a tourist enjoying an exotic vacation.” An exotic vacation. Yes, a far cry from English Composition I. Unfortunately, my fashion has calmed down somewhat over the years. However, I still have an eye for loud colors and unusual patterns, much to the dismay of my husband and children. For most of my life, I have identified with being Christian, a Christ-follower. I have gone to church faithfully (well, except for my college days, but that’s another post) since I was nine, and I rarely had any problems with the experience. Aside from the nosy old biddies that seem to be part and parcel of every congregation regardless of denomination or location,for the most part, church has been enjoyable, peaceful, and uplifting. Lately, however, I find myself a bit disillusioned and at times disconnected from something that I used to look forward to on a weekly basis. It may have a lot to do with where my family is attending church right now, although I’m not sure if it’s a personality issue, a spiritual issue, or a denominational issue, but I can honestly say that I don’t feel the same about going to church as I once did. And I know I’m not alone. A lot of people seem to feel this disconnect with something that used to be such an integral part of their lives. I struggle to find a single word to describe my dissatisfaction, but a number of my non-churchgoing friends immediately label it as hypocrisy. I’m not sure that I would label it that strongly, but some things I’ve observed over the past few years have really caused me to question my faith life and organized religion. Let me explain a little of what I mean. One thing I’m having trouble with is how quick some churchgoing Christians are to re-label things in order to make certain practices more “Christian.” This came to the forefront for me again yesterday, Easter Sunday. Oops, I forgot; we aren’t supposed to call it Easter anymore. This was brought up in my adult Sunday school class last Easter. Oops again. Easter is not a Christian holiday; it is a pagan festival honoring the goddess Ostara, and it focuses on fertility and rebirth. By calling the celebration of Christ’s Resurrection Easter, we are cheapening what Christ did on the Cross and placing our sights on things we should not even acknowledge. In some ways, I get that. Of course we are not, as Christians, supposed to focus on pagan practices and celebrations, so I understand why some pastors and other believers strive to call the day Resurrection Sunday instead of Easter. Like a lot of other people, a change like that is difficult to make, when I have been calling the day Easter all my life, as a lot of others have done. But it’s not the suggestion to re-label the holiday in itself that irritates me. It’s the attitude that those who still wish others “Happy Easter” are somehow less Christian than those who use the greeting “Happy Resurrection Sunday.” Sounds a bit like the Merry Christmas/Happy Holidays quandry, doesn’t it? That in itself is perplexing enough, but what really made my head throb yesterday was that amid the “Happy Easter” bashing I was still hearing, someone in our Sunday school class bemoaned the fact that her children that morning didn’t come running in all excited about what the Easter bunny left in their Easter baskets. Wait, I thought we weren’t supposed to acknowledge the pagan celebration with its eggs and bunnies? During the church service, I had another head-scratching moment when someone on the worship team related a story from her childhood. In the early days of her married life, when her daughters were very young, her family had traveled around as evangelists. Once, they got to a point where the money had run out, and they were waiting for God to provide. He did provide, by sending a woman who felt led to purchase a month’s worth of groceries for them. This happened close to Easter–Resurrection Sunday, darn it–and as they wandered through the local Costco, they passed a display of prepackaged Easter baskets, the kind with life-sized stuffed rabbits and tons of candy that cost around $40. The woman footing the grocery bill turned to them and asked, “Do you need Easter baskets for your children?” After a moment’s hesitation, she related that their response was, “Why, yes. Yes, we do.” Maybe I’m being petty or even judgmental, but I had a bit of an issue with that. Again, if Easter, Easter eggs, Easter Bunny, and Easter baskets are part of a pagan observance, then why didn’t they just politely refuse? A similar beef I have with a lot of Christian churches, not just ours, is the uproar over celebrating Halloween. Again, I understand the desire to avoid the pagan and sometimes sinister associations that the day holds, and for a number of years, I refused to participate, trying very hard to fit in with the church we had recently begun attending. In an effort to show how godly and spiritual I was, I even taught a Bible study in which I spoke out against all the Halloween traditions that were rooted in pagan practices–trick or treating, costumes, pumpkin carving, apple bobbing, etc. My resolve began wavering and then went completely out the window as I saw more and more churches throwing “Fall Festivals,” “Harvest Celebrations,” or “Hallelujah Parties” instead of traditional Halloween parties. On the surface, that seems like a good idea. But then I looked at the activities done at these parties: trunk or treat, costumes, pumpkin carving, apple bobbing. It struck me as odd that these things were okay when part of a Christian celebration, but not if they were part of a Halloween observance. It’s as though we have sanctified the activities by labeling them as Christian and placing them in a Christian-themed party. Another aspect of church life that gets to me at times is the focus on the ways different congregations worship–traditional vs. contemporary, liturgical vs. charismatic or free-church. I grew up in a church whose worship was traditional and liturgical. Never did I feel stifled in that setting, and in fact, I often felt very reverent in the presence of God in that setting. The hymns made me think about the deep theology behind many of them, and the tunes often played through my head even outside of church. I loved the different parts of our order of worship–the corporate confessions and prayers, the weekly recitation of the UCC Statement of Faith and the Apostles Creed, the various sacraments, etc. The church we are attending now is Pentecostal in nature, free of liturgies, a definite altar, robed pastors, and almost no hymns. We have a praise and worship team that performs contemporary music with lights, words on the big screens, and a lot of jumping around. For me, someone with occasional sound sensitivity, it’s very loud and not at all conducive to a worshipful setting. I feel I’m in a rock concert setting instead of a church setting. Does that mean they’re wrong in their practices? No, I am not saying that. It’s quite obvious that many people do get into a worshipful mood with the songs they sing at our church, but I do not. Again, here is where problems begin for me. While I have no problem with fellow church members enjoying and declaring their love for this type of worship, I do have a problem when they start putting down liturgical worship, or preferring old traditional hymns over the contemporary music. “If you’re following liturgies, you’re not allowing the Spirit to move in your church.” “How can corporate confessions and prayers really be meaningful and acceptable to God?” “People who worship in those churches aren’t really worshiping; they’re putting God in a box.” Isn’t it putting God in a box to say that He cannot move in a traditional setting? Sometimes the trappings of my faith make me question more than anything I’ve ever questioned from the Bible. I do not doubt who Christ is or what he did for me. I simply find it harder to be among people who often seem more concerned with elevating themselves and their personal interpretations of Scripture above others who don’t believe exactly as they do. “By the power of peppermint mocha, I am Persephone Faith.” With a shaking hand, I raise my white porcelain travel mug in a salute to the heavens and take a sip of the ambrosia that fuels my bravado. As the minty caffeine-infused liquid warms my throat, I feel its power flow through my veins to still my quivering nerves. Opening my eyes, I take a deep breath and tug open the door labeled “GLOW Youth Ministry.” A cacaphony of voices spills out into the hallway, echoing in my ears and seemingly pressing against me, forbidding me to enter the room. Will this be like the last time? I ask myself. Will they judge me and cast me out when they find out who I really am? Give them a chance, Percy Faith. Granny-Belle’s voice comes to mind, momentarily soothing my disquieted soul. Let them get to know you before you make rash judgments. But Granny-Belle, it’s never a question of me giving them a chance. The question is, will they give me a chance? Holding my head high, I step inside the room. My gaze sweeps across the room, scanning the faces of the teenagers scattered about on cast-off sofas, sitting on bar stools at a counter, or engaged in assorted games. I am looking for someone, anyone who looks amiable enough to approach. My resolve crumbles. I can’t do this. I’m not fearless, I’m not feisty, and my faith is gone. I am a coward. I turn to run from the room and run headlong into someone. Just signed up on bloglovin’. Come follow me! I am an INFP. One of the truest aspects of my personality type is that I hate conflict. I would rather run and hide than ever meet a tough situation head on. My INFP tendencies have followed me right in to my writing career. Ghosts have been a fascination for me since I first saw one as a young child. As a teenager and a young adult, I read a lot of novels which centered on a ghost or haunted house. So naturally, when I began writing in earnest, my genre of choice was paranormal mystery. I’ve always loved stories in which a ghost is present because there is a mystery to be solved. Well, to make a long story short, my belief and interest in ghosts has gotten me into trouble with some of my church-affiliated friends and acquaintances. (If you want the long story, you can read it here.) So how was I going to deal with being published and having my name out there, attached to novels that deal with the very topic that caused such a stir in my religious life? I took a pen name. Granted, that was not the only reason I decided to use Leta Hawk instead of Deb/Debra/D.S. Lerew, but in all honesty, it was a big one. It was always in the back of my head that eventually folks would put two and two together, and the cat would be out of the bag, but I would cross that bridge ( or run away from it) when I came to it. Fast forward about a year, after I’d released two paranormal mysteries under my pen name. I’ve been promoting on my Facebook author page, on Twitter, and here on my blog, but I never shared things from my author page onto my personal Facebook page, hoping to keep the mask on and avoid the inevitable conflict. It honestly killed me inside that I couldn’t share my events or my successes with my friends at church, because I was afraid of the disapproval I knew would come. Until something happened about a month ago. Another author friend and I had book tables at a local book sale in a church setting. The pastor of that church is also a writer, and he writes what he calls “dark parables,” so he understands my predicament. Since this was a bit out of the way, I was sure that no one I knew would actually show up, so I had no worries for the day. Well, towards the end of the day, I looked up and saw someone I recognized from one of my church-related activities. My heart stopped. What if she saw me? What if she came over to talk to me? What if she picked up my book and realized that I write about…ghosts? I was on the verge of diving under the table and hiding until she left, when something rose up in me. “I’m done,” I declared to my friend. “I’m taking control of this right now.” I stood up and walked over to my friend, intending to “bust myself out,” and let the chips fall where they may. Shell-shocked, I returned to my table, looking, I suppose, as though I’d seen a ghost. I told my friend what had happened, and something inside me shifted. I felt as though chains had fallen from me. I had done the unthinkable and shared the heart and soul of my writing to someone I was certain would disapprove, and the world hadn’t ended. I wish I could say I have completely abandoned my flight-over-fight worldview, even if only in my writing life, but I have not. I have begun to speak a bit more freely of my chosen genre and to share, even with people at my church, that I am indeed a writer or **shudder** ghost stories, but I still have a ways to go. But I can finally say that there is hope for this avoider of conflict. Poem: How Agile Is Your Tongue? To pull it into a loop. In this dance of determination. Tighter between teeth and tongue. From so many male acquaintances? The skies have fascinated me for as long as I can remember. From childhood all the way into young adulthood, I often spent hours gazing at stars on summer–or even winter–nights. The dance of constellations across the sky tickled my imagination, and I came to view them as friends, especially Orion, whom I still greet on frosty winter nights when I walk the dog. Someday I will have a fancy camera to take pictures of my nighttime visions. Weather, too, creates a dance in the sky that I am compelled to watch. Clouds and colors, snow and rain, all create their own intricate steps. The photo above was taken the day before the January 2016 blizzard began. “Red sky in the morning, sailors take warning.” We don’t live in an area where sailors work; still the saying is familiar, and the dance of red, pink, and orange that morning proved correct an old adage. Fog is often beautiful as it obscures my surroundings. While I don’t like driving in it, especially at night, I do love watching it swirl along the mountains near our home. Extreme weather both interests and terrifies me. I went outside one summer evening and saw these mammatus clouds swirling above my house. I had seen many photos of them and thought they were beautiful, but I never expected to see them here in Pennsylvania. I almost felt dizzy as I watched them; the scene was so surreal. The skies provide the perfect stage for the never-ending dance of wind and weather, and sun, moon, and stars.